Fire Prevention Week™ is in the bag! 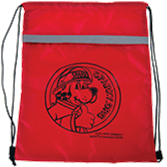 Kids love the Sparky® Drawstring Sports Bag featuring Sparky the Fire Dog® and his "Team Up for Fire Safety" message! They'll tote this lightweight draw string bag around everywhere -- to school, to the field, to their friends' houses -- and when they do, they'll spread a lifesaving message. Durable and rugged, made to withstand getting tossed around, this bright red polyester bag also features Sparky® in the center in bold black. String shoulder straps on the backpack loop allow for quick closure on the run. Includes zipper compartment and reflective strip.